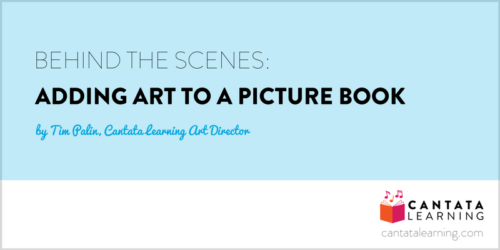 The first step in the art creation for a Cantata Learning book is. . . find out what the books are going to be! I start by reviewing the list for the upcoming season with the editorial team to find out what the stories are and what we think we want the season to “look like.” I might ask questions like: Should this be light-hearted and cute? Or are we touching on more scientific themes and you see this as more non-fiction realistic? I see this story having very dense, detail-heavy artwork; do you agree? Do you envision the characters being kids or animals with human qualities? (By the way, there’s nothing cuter than a puppy and a bunny having a picnic.) Sometimes, as the manuscript is taking shape, the editors might start to have a particular art style in mind, or have a reference in mind. It’s important for us to have this conversation early on to make sure we head down this path from the same starting point. Next, I put together a wish list of artists that I think can make the stories come alive. I look for artists that would be a good match for the manuscript which is being written at the time. We take quite a few factors into account here. For example: Do they mainly draw animals or people? Do they have a more playful style or a more realistic style? 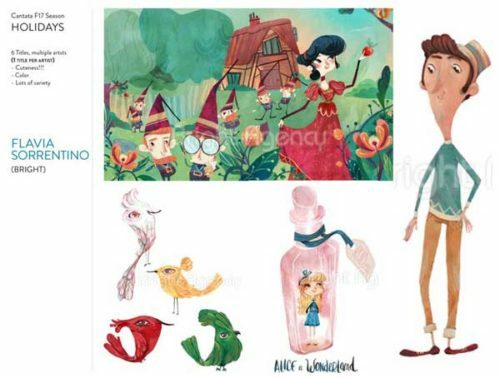 Does their work have a European look and feel for this retelling of Hansel and Gretel? Can they capture the adorable silliness of baby pandas climbing the ropes in gym glass? 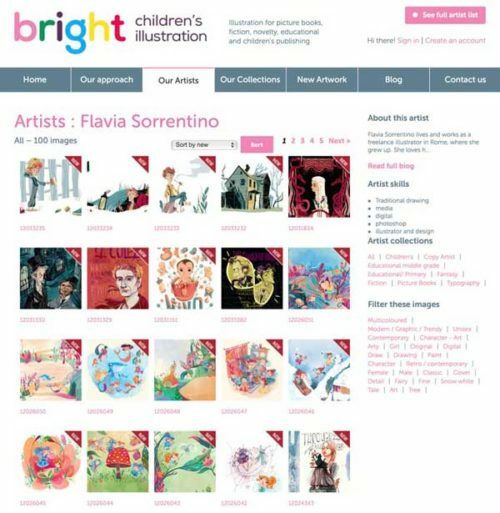 The editorial team and I then review these artists and make a first pass at creating a roster of illustrators for the season. Here’s a sample of an artist’s presentation I might show to the team. This is a way to see, at a glance, not only the artists that I’m recommending for the book, but also a few key words that we have in mind when matching an artist to a story. 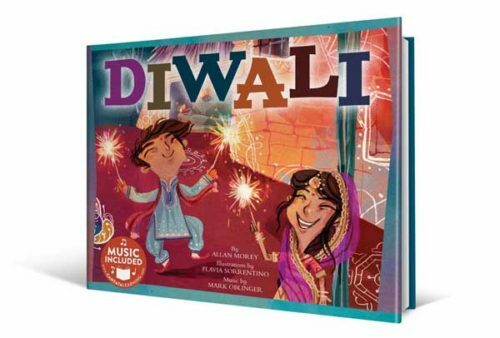 This is the sheet (below) that I used to propose Flavia Sorrentino (represented by Bright Agency) for Diwali. By this time, we’d agreed as a team that the art must be cute and colorful with lots of variety (in shapes, textures, and tone). Additionally, we knew that we wanted the art style to be as uniquely beautiful as the Diwali holiday itself. We wanted something unexpected. Flavia’s art fit that bill perfectly! Cantata Learning works with a combination of independent artists and artists represented by agents. The next step is reach out to them to make sure everyone is on board! Sometimes, we have to go back to the drawing board if an illustrator is busy. This is a big fingers crossed moment! We’ve been blessed to have some pretty incredible talent from around the globe join the fun. In this case, I’m delighted to say that Flavia was a quick “yes”! Hooray! Once the illustrator roster for the season is set. . . the real fun begins! I send the manuscript and art notes out to them and wait. This is also the hardest part. . . the waiting, that is. But I keep myself busy putting some more touches on the layouts where I’ll eventually place the art. Sketches are in! That’s right, my job means that every once in a while I arrive at my desk bright and early, and my inbox is full of art from all over the world. . . Italy, Japan, Australia—so many amazing places! Once the sketches are sorted, the art, editorial, and music teams review them. Sometimes, they’re perfect right out of the gate. Sometimes they need a little love. . . a few tweaks here and there. For example, check out the pages below. 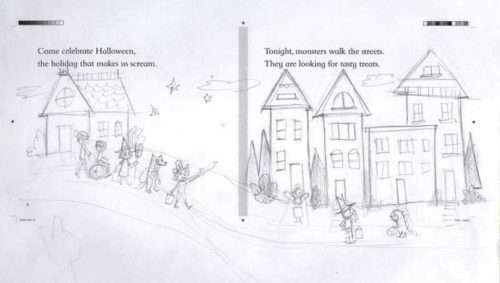 When we received the sketches for Flavia’s Diwali book, we absolutely loved this spread. However, in a last minute move, we decided to remove the little girl drawing a rangoli on the wall and move her creation into the background. These beautiful rangolis are normally drawn on the ground, rather than on a wall. For many of our books, the art notes that go back to the illustrators reach beyond an asthetic preference. Like in this case, it was so important to be culturally accurate. Check this next one out (below). The woman in the foreground holding the platter is wearing a sari. The consultant that Cantata Learning worked with to ensure that all the details are correct pointed out that, in this sketch, it appears that the veil is separate from the sari. In reality, the veil is part of the full-length garment. This was corrected in the color art in the following weeks. It might seem like a small detail that one could overlook, but these notes are so important. This change was a crucial one to make. It worked out beautifully. Once the book is full of beautiful, original art. . . We need a cover!!! Sometimes, we make the cover out of a page of the inside of the book. In the case of Diwali, that’s exactly what I did. Flavia’s page 15 made a lovely front cover! Since we’re in a Holiday state of mind. . . and Halloween right around the corner. . . here’s a fun peek at Halloween! For this book we were looking for something current and cool. We grabbed our pal Doreen Mulryan for this one. 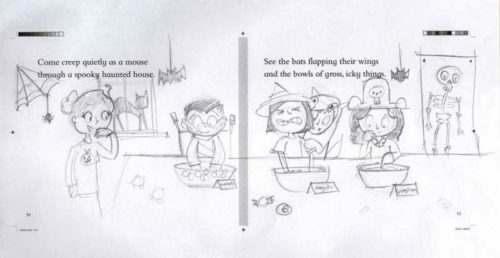 Here’s a peek at a few of the early (and very scary) sketches. Here are a couple sketches that needed some extra love by Doreen before going to color. Can you spot the differences we asked for? Doreen loves Halloween, and it shows. BOO!